You know about WhatsApp, the mobile messaging app that allows you to send short messages to friends without paying SMS fees, even if those friends use a different phone or network. And you surely know about emoticons, those tiny smiley faces that you can include in messages illustrate and emphasize your emotional state. Emoticons are what you use to let friends know if you are happy, sad, confused or just thinking about fixing some scrambled eggs. 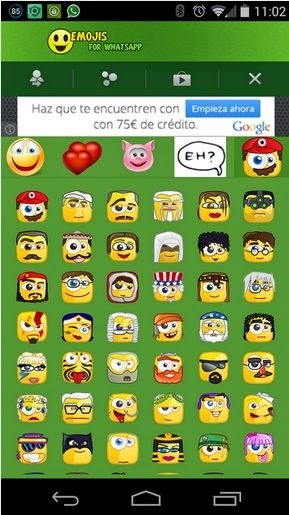 Emoji Emoticons is an app that makes an enormous collection of emoticons available for Android users. The collection doesn't stop with a few smiles, frowns and hearts. The symbols are grouped under several toopics such as faces, love, animals and characters. For example, there's a whole page of more than 40 different hearts. Some looks like a box of Valentine cands. Others wear glasses and a moustachs. See if any of them match your state of mind at the Google Play Store.